So, you have cleared the IAS Prelims successfully. 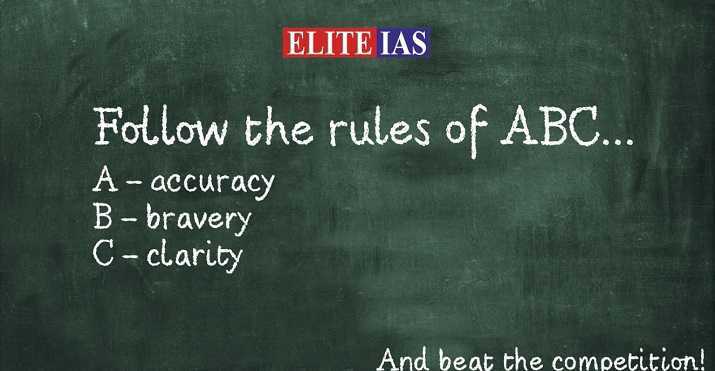 Now, you are marching ahead on your way to clear the IAS Mains! 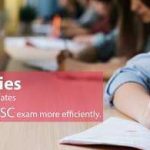 Even if, you would like to prepare for the Prelims and the Mains simultaneously, it is wise to remember that UPSC prescribes the syllabus for the Mains in greater detail than it does for the Prelims. So, needless to say, preparation for the Mains requires a smarter approach than it does for the Prelims. But it should also be noted that UPSC looks for efficient Civil Servants and not great scholars. Knowledge alone is not going to serve any purpose, if UPSC is not convinced (after your answers are evaluated) that you may be a promising Civil Servant. As a result, your answers, should reflect all the qualities that UPSC looks for in capable Civil Servants. Obviously, the answers that you pen down in the UPSC Mains examination are required to be written in a manner so that UPSC stands convinced that you would be suitable to join the Civil Services. The answers penned down by you in the examination hall should be well structured. They must bear an introduction and a suitable and logically required description that should follow it. Besides, there should be a justifiable and logical conclusion. The candidate must have a thorough knowledge to answer the question paper well. Otherwise, there is bound to be unnecessary chatter, rather than what the question logically requires. Writing at length with no substance is not going to help you score any marks. Remember that there is no room for any kind of jargon, unnecessary descriptions, or clichés. And there is a golden rule that quality is always better than quantity. So, the answer should focus precisely on what the question has asked for. And that requires thorough knowledge. In case, UPSC selects you, and you are allowed to join the cadre of your choice as well, you would be required to take specific decision in specific or even peculiar circumstances, as the case may be. And as already stated above, UPSC prefers those who would be able to serve as highly efficient Civil Servants. So, you should not express any general opinions. Be specific, what you write. No generalizations, please, as it only serves to prove that the candidate is not confident enough to make a decision and/or take the responsibility for his actions. Mentioning some quotes where they are logically required in support of your answer is a good idea. But do not give too many of the quotes. In that case, these are rather the great thinkers who are answering the UPSC question paper and not you! And it is you who is facing the exam in the great expectation of joining the cadre of your choice. So, take a stand, express the opinion, and support it with some quotes (as required in a logically justifiable manner) rather than too many of them. It is best to be innovatively original. Remember, UPSC is testing you and not the great authors whose books you might have read to prepare for the exam. So, do not cram the content and try pouring it down on the answer sheets in the examination hall. That will simply not serve any purpose. Try answering the Past years question papers. Do it repeatedly. Remember that practice makes a man perfect. The more you answer the previous years papers, the more you would sharpen your skills to answer the question papers in the UPSC Mains exam. 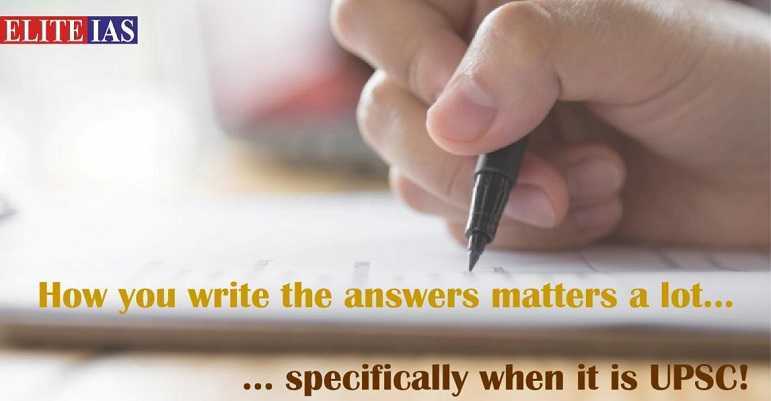 Besides, if you attempt the Unit Tests at the UPSC coaching institute (if you are enrolled at one) or even solve the Online Test Series for the UPSC exam frequently, you will find that your answer writing skills have reached nearer perfection than what they might have been initially. It is best to stay away from all kinds of prejudices and getting personal. Anyone who entertains any kind of prejudice is more likely to get personal and even impulsive at times. It is likely to be reflected in your answers. These are some of the negative traits that should not be there in any individual with a healthy psyche, least of all, a Civil Servant. So, it is advisable to keep your mind away from these negativities, otherwise they might crop up in your answers while answering the UPSC exam and you would not be able to score well even if you have gained a thorough knowledge of the subject. Stay focused on what has been asked in the question paper. No digressions of any kind are appreciated by UPSC as it only proves your answer does not have much of the substance in it. Be sure that what you write conveys your ideas in a crystal clear lucid language. A confused language only serves to convey that the writer himself is confused and remember that a confused mind may not serve the nation as an efficient Civil Servant. Whatever facts and details you include in your answers should be accurate. Besides, they should be presented in a logical manner as well. It serves to add to the convincing appeal of the answer. All of your answers in the UPSC Mains Exam should follow a basic rule of ABC i.e., Accuracy, Brevity and Clarity. If they do not, they only serve to represent a confused mind, not fit to function as a Civil servant.